AFTER last week’s near washout it was raining runs yesterday as batsmen in several quarters welcomed a return to sunny conditions. Pride of place was claimed by Poloc who recovered from the worst possible start to post a huge total of 369-2 in their Western Premier clash with Greenock at Shawholm. That looked a long way off when Amaan Ramzan was bowled by Saurabh Bandekar off the first ball of the match. However, a superb partnership between Craig Young and Jurie Snyman soon had the scoreboard ticking as both players eyed big scores. Snyman recorded his second century of the campaign and proceeded to convert it into a double hundred with an array of blistering shots. The South African hit fifteen boundaries and astonishingly matched that figure in maximums to reach 209 from only 146 deliveries before he was finally dismissed by Neil Flack. Young, meanwhile, carried his bat for a composed 128no which, on any other day, would have been the headline performance. In contrast Greenock were unable to muster three figures between them and, with Chris Hempsey injured, finished on 92-9, Coenie Nel claiming 4-6 and Ahmed-Raza Hanif 3-8. Leaders Ferguslie also passed the 300 mark as they overcame champions Prestwick at Meikleriggs where Gregor Preston-Jones was another of the day’s centurions with a brilliant 102. His opening stand of 160 with Michael English (65) set the platform before Elliot Moses (74no) propelled the Paisley team to 303-4. Skipper Jamey Carruthers then performed a one-man demolition act on Prestwick’s top order, reducing them to 18-4, before the Tahir brothers, Haroon and Hamza, claimed 3-4 and 3-10 as the visitors slumped to 45 all out. A third defeat of the campaign means Prestwick’s grip on the trophy has been further loosened while Ferguslie have the look of champions though Clydesdale may have other ideas after prevailing by seven runs against Uddingston at Bothwell Castle. In a keenly contested affair Richie Berrington top-scored with 47 while Kallum Dhami added a valuable 43no as Dale clawed their way to 191 all out. Amir Gul led the reply with a battling 59no but he ran out of partners as five visiting bowlers claimed two wickets to clinch an exciting win. Stirling struggled early against West of Scotland at New Williamfield, slumping to 88-6 before Brandon McMullan (pictured above) struck a superb 127 sparking a recovery to 263 all out with Tom Jones also contributing 78 to a crucial seventh wicket stand of 163. In reply West’s batsmen had no answer to Rukman Hewage who claimed 6-21 to help clinch a 145-run win. The high-scoring trend was bucked at Cambusdoon where bottom side Dumfries were dismissed for 112 allowing second bottom Ayr to ease to a five-wicket win. WATSONIANS were the Eastern Premier’s big scorers, hitting 336-3 to ease their relegation fears with victory over Aberdeenshire at Mannofield. Mike Carson thumped 175, eclipsing the 167 he scored against Falkland last season, while Ewan Chalmers finished unbeaten on 100. ‘Shire’s top order then collapsed to 20-5 as the issue was quickly put beyond doubt, ‘Sonians eventually winning by 115 runs. Forfarshire were also in free-scoring form with Rory Johnston hitting 84 and Michael Leask 68 in a total of 313-8 - too many for Glenrothes who responded with 142 to remain winless. Leaders Grange refused to give Stewart’s Melville a sniff of a big total as they maintained their 100% record with a nine-wicket victory at Inverleith. Gordon Goudie starred with 4-18 as the hosts were all out for 86 before Nick Farrar’s rapid 56no carried Grange to the target inside thirteen overs. Hayes van der Berg and Elnathan Meiri struck half-centuries as champions Heriot’s passed Arbroath’s 183-6 to win by seven wickets at Lochlands. 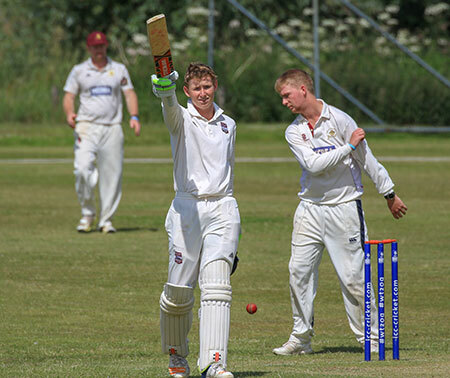 Corstorphine’s Jacob Wood claimed five Carlton wickets at Barnton but Michael Castle’s 54 proved decisive as the visitors secured a morale-boosting derby win by ten runs.